In 2004 Lorenzo Rossi was with an expedition to Nepal. "I found many nests of "tree bear" when I was in Nepal and many people tell me that in Nepal live "Bhui-Baloo" (earth bear) and "Rhuc-Baloo" (tree bear), but no one tell me that Rhuc Baloo have paws like human hands. Ide talks about a pigmy nepalese bear but rhuc baloo and bhui baloo are the same animal. Finally the pictures of the print in Ide book isn't a bear footprints... 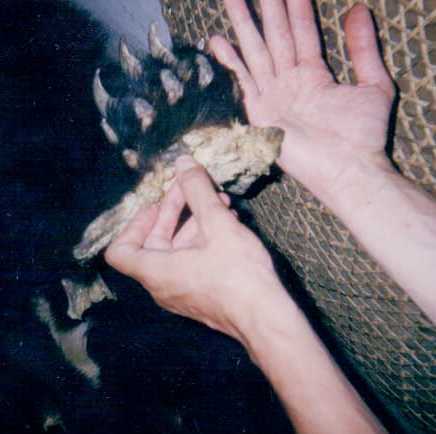 I send you a pictures of my hand comparison with a front paw of napalese black bear..."
"I have personally noticed that the marks of the claws of black bear that climbing a tree are always four and never five".